No. 1: Crying. Don't. No matter what. No. 2: Snitching. Don't. No matter what. No. 3: Revenge. Do. No matter what. But bullets miss. You can get the wrong guy. And there's always someone else who knows to follow the rules. Review: Another Jason Reynolds right after reading Ghost! This story is so different from Ghost, but equally powerful. And, because it's in verse it is a quick read. 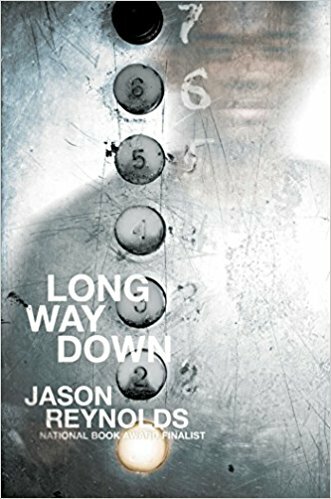 Jason Reynolds is fast becoming one of the authors I most admire; I hope his books are making a difference in the lives of his readers. This one easily could do that. This is one of those books where I can't say anything about the plot beyond the summary above because that would ruin the reading experience for others. I can say that it is intense, doesn't go where I thought it would, and makes a great point about the cycle of violence. The "Rules" lead to death and heartache without any resolution. I wasn't sure how an elevator ride of seven floors could possibly work in a book; it's got to be the shortest time span of any book I've read. But it works very well and is very effective as each floor brings Will a step closer to killing his brother's murderer. I highly recommend this book for high school students and adults.